Many Americans are expressing shock at the Trump administration’s policy of separating children from their parents at the United States’ border with Mexico. Slave families were often separated in sale. Slave owners could sell slave children to anyone. Their parents had no legal rights to prevent their sale and could do little to stop them. Some slave families attempted to escape. But all faced severe punishment, even death, if captured. Last week, U.S. Attorney General Jeff Sessions used the Christian holy book, the Bible, to defend the policy of forced separation. That same passage was cited before the Civil War as a defense for separating slave children from their mothers. In the 1870s, the United States began a policy of forcible assimilation for Native Americans. The government ordered the removal of Native American children from their families and reservations. They were sent to boarding schools that many described as similar to prisons. The schools were established with the goal destroying all Indian tradition and nature within the child. At about 150 Indian schools around the country, officials made Native American children cut their traditional long hair and banned them from speaking in their native language. The schools forced the children to accept Christianity and white customs. Native American children returned home almost unrecognizable to their parents. Still, some children resisted by setting fires to buildings, running away or taking their own lives. Others continued to speak their native language in secret. Some Navajo “code talkers” were students at the boarding schools as children. During World War II, they used a code based on their native language to send secret messages for the U.S. military. Indian boarding school policies remained in place through the 1960s. During the early 1900s, American states sometimes took children from poor families and placed them in orphanages. Author Michael Katz wrote in his book “In the Shadow of the Poorhouse: A Social History Of Welfare In America” that this practice ended in the 1920s and 1930s. However, Katz said, local and state officials continued to use poverty as a reason to take children away from Native American and African American families. Sometimes the ordered separation came over concerns about a parent’s mental health. The late civil rights activist Malcolm X described his experience of such treatment in a book about his life. He wrote that government workers took him and his siblings from his mother after the murder of their father. He said he lived in several foster homes and boarding houses. He said his mother, without her children, had a psychological breakdown and was ordered to a mental health asylum. During the Great Depression, California and Texas officials blamed Mexican immigrants and Mexican Americans for the economic event. They forced between 500,000 and 1 million Mexicans and Mexican Americans to leave the U.S.
Francisco Balderrama co-wrote “Decade of Betrayal: Mexican Repatriation in the 1930s.” He said some families hid children with family members in the U.S. to prevent them from being sent from the country. Former U.S. first lady Laura Bush criticized the current family separation policy in an opinion piece published by The Washington Post newspaper. 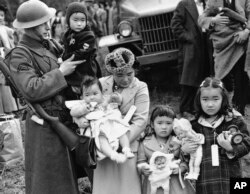 In 1942, shortly after the bombing of Pearl Harbor by Japanese forces, President Franklin Roosevelt signed an order forcing around 120,000 people of Japanese ancestry into internment camps around the country, including 30,000 children. George Takei is an American actor who was sent to an internment camp at the age of five. I’m Jonathan Evans. And I’m Ashley Thompson. cite - v. to write or say the words from a book, an author, etc.